A turning point in twentieth-century American history, the war in Vietnam raised profound questions that affected every aspect of life in the United States. A dramatic case study of the political passions, spiritual pain, and cultural divisions produced by the war, What's Going On? 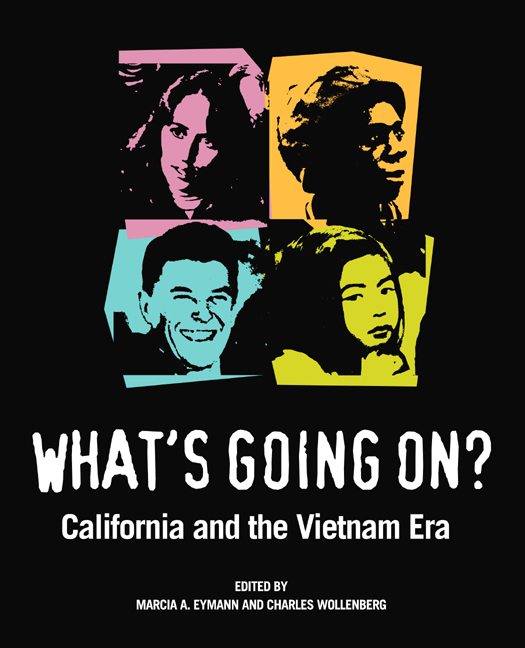 California and the Vietnam Era provides for the first time a balanced and personal look at the Vietnam years in California, revealing their impact on American life and culture. Wallace Stegner believed that California "is like the rest of the United States, only more so," and in this book we discover the truth behind that sentiment. Conceived in tandem with the Oakland Museum of California's innovative national touring exhibition of the same title, this absorbing collection of essays captures the essence of a unique time and place. The exhibition itself centers on events between 1965 and 1975 and examines the legacy of those years on the state today through some 500 historical artifacts—documents, news accounts, photographs, film clips, musical excerpts, and personal stories presented in multiple formats. These accompanying essays delve deeper into the themes raised by the exhibit, looking into such topics as the relationship between Cold War politics, the Vietnam War, and California's economy; social activism from the Right and the Left; the rise of the feminist, African American, Chicano, and veterans' movements; Vietnamese refugees; media images of the war; and the legacy of those years on the entire nation. Marcia A. Eymann is Curator at the Oakland Museum of California and coeditor, with Drew Heath Johnson, of Silver & Gold: Cased Images of the California Gold Rush (1998). Charles Wollenberg is Professor of History at Vista College and author of Marinship at War: Shipbuilding and Social Change in Wartime Sausalito (1990).